Unboxing: Coleco’s Electronic Quarterback from TRON! It’s the small treasures that are odd that, to me, really make a collection special. As a TRON collector, I am always interested in what little odd things I can find that other collectors might not think of, such as the popcorn maker. Unboxing: Original TRON Soundtrack LP (1982)! I’m always on the lookout for original TRON items from 1982 and was lucky enough to find this gem on ebay! Unboxing: Alan Bradley’s popcorn maker from TRON (1982)! As you know, I am a HUGE TRON fan. Off and on, I have spent 4 years trying to track down any information on the popcorn maker that Alan Bradley used in the “popcorn scene” in TRON from 1982. It seems like an odd thing to want, but, hey, who doesn’t like popcorn! Especially if it’s from TRON! 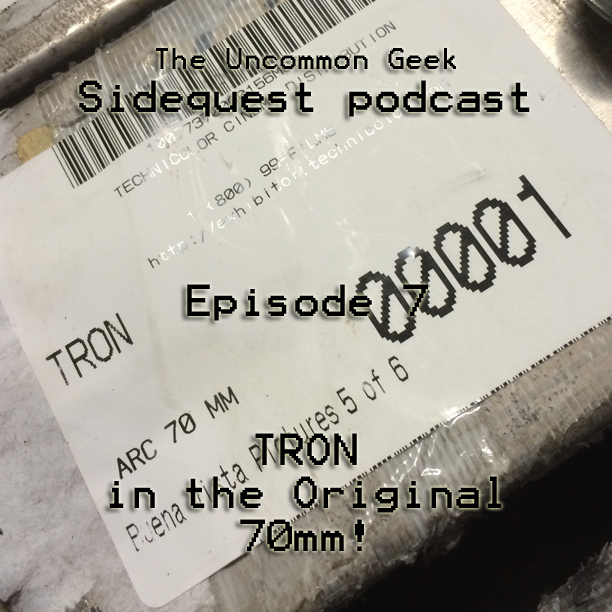 Seeing TRON on the Big Screen from the Original 70mm (Podcast Included!). How many chances does one have to take advantage of a once in a lifetime opportunity? And what if that opportunity is to see ones favorite movie of all time on the big screen? With modern digital projectors, all one needs is their favorite movie on DVD or other digital media, hook it into the projector and BAM! Big screen experience.